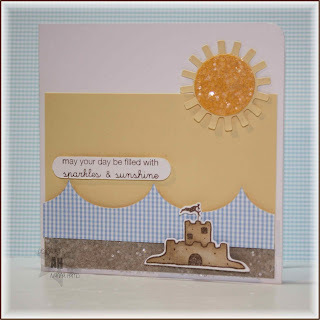 I started this card out with the sandcastle stamp. I made a sandy border with a strip of kraft that I ran through the xyron and glittered. I made the waves with my new MFT scallop die (LOVE it!!). I added the sunny coloured background and a sparkly sunshine. The sun was cut out using my cricut. I had to fiddle with the sentiment to get it to fit into the word window punch...it's actually longer than the punch shape. I won't try to describe this myself as GinaK has already made a lovely tutorial with pictures about how to make a long word window punch shape. 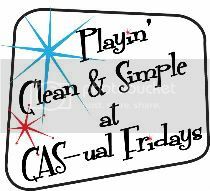 This card certainly isn't my usual CAS style, but I like it!! There's still some white space, right??!! Have a great day...hope you can play along in the challenge!